Having read The Cookoo’s calling, The Silkworm and Career of Evil, I would like to read Lethal white, the latest gripping mystery thriller by Robert Galbraith. It again features Wounded War Veteran turned Private Detective Cormoron Strike and his invaluable assistant Robin Ellacott. This opens in 2012 immediately where book 3 finishes at the the wedding reception of Robin Ellacott and husband Matthew. Elsewhere preparations are also being made for the London 2012 Olympics. Then Billy, a troubled young man, comes to private eye Cormoran Strike’s office to ask for his help to investigate a crime he thinks he witnessed as a child. Strike is left deeply unsettled and While Billy is obviously mentally distressed, and cannot remember many concrete details, there is something sincere about him and his story and he wants to know for definite if he really did witness a crime, or whether it is part of his illness. However before Strike can question him further, Billy bolts from his office in a panic. Strike is then asked to help a government minister who is being blackmailed. So Strike and Robin Ellacott – once his assistant, now an invaluable partner in the agency – set off to investigate on a twisting trail which Takes them from the backstreets of London, into a secretive inner sanctum within Parliament, and a beautiful but sinister manor house set deep in the countryside. Meanwhile Strike’s own life is far from straightforward: his newfound fame as a private eye means he can no longer operate behind the scenes as he once did. Plus, his relationship with his former assistant is more fraught than it ever has been – Robin is now invaluable to Strike in the business, however their personal relationship threatens to compromise their business relationship . . . Famous for his work in painting, sculpture, printmaking and regarded as one of the founders of Impressionism, the French artist Edgar Degas sadly died 27 September 1917. he was Born 19th July 1834 in Paris, France. He was the oldest of five children of Célestine Musson De Gas, a Creole from New Orleans, Louisiana, and Augustin De Gas, a banker. His maternal grandfather Germain Musson, was born in Port-au-Prince, Haiti of French descent and had settled in New Orleans in 1810. Degas began his schooling in 1845 enrolling in the Lycée Louis-le-Grand. His mother died when he was thirteen, and his father and grandfather became the main influences on him for the remainder of his youth. Degas began to paint early in life and became a superb draftsman. He graduated from the Lycée with a baccalauréat in literature in 1853, at the age of 18, and turned a room in his home into an artist’s studio. Upon graduating, he registered as a copyist in The Louvre Museum, but his father expected him to go to law school. Degas duly enrolled at the Faculty of Law of the University of Paris in November 1853. In 1855 he met Jean-Auguste-Dominique Ingres, whom Degas revered and whose advice he never forgot: “Draw lines, young man, and still more lines, both from life and from memory, and you will become a good artist” in 1855 Degas was admitted to the École des Beaux-Arts. He studied drawing there with Louis Lamothe. Early in his career, he wanted to be a history painter, a calling for which he was well prepared by his rigorous academic training and close study of classic art. In July 1856, Degas traveled to Italy and In 1858, while staying with his aunt’s family in Naples, he made the first studies for his early masterpiece The Bellelli Family. He also drew and painted numerous copies of works by Michelangelo, Raphael, Titian, and other Renaissance artists. Degas returned to France in 1859, and moved into a large Paris studio And began painting The Bellelli Family, intended for exhibition in the Salon. He also began work on several history paintings: Alexander and Bucephalus and The Daughter of Jephthah, Sémiramis Building Babylon and Young Spartans. In 1861 Degas visited his childhood friend Paul Valpinçon in Normandy, and made the earliest of his many studies of horses. He exhibited at the Salon for the first time in 1865, exhibiting the painting Scene of War in the Middle Ages and continued to exhibit paintings at the Salon for the next five years including “Steeplechase—The Fallen Jockey”. Degas then abruptly changed subject matter bringing the traditional methods of a history painter to bear on contemporary subject matter, he became a classical painter of modern life. This was inspired in part by Édouard Manet, whom Degas had met in 1864 (while both were copying the same Velázquez portrait in the Louvre. During the Franco-Prussian War Degas enlisted in the National Guard, where his defense of Paris left him little time for painting. Sadly his eyesight hindered him. In 1872 Degas visited New Orleans, Louisiana, where his brother René and a number of other relatives lived. Staying at the home of his Creole uncle, Michel Musson, on Esplanade Avenue, Degas produced a number of works, including A Cotton Office in New Orleans, many depicted family members. In 1873 Degas returned to Paris sadly though his father died in 1874. Degas also learned that his brother René had amassed enormous business debts. To preserve his family’s reputation, Degas sold his house and an art collection he had inherited, and used the money to pay off his brother’s debt. In 1874 joined a group of young artists including Monet, who were organizing an independent exhibiting society. The group soon became known as the Impressionists. Between 1874 and 1886 they mounted eight art shows, known as the Impressionist Exhibitions. However Degas deeply disliked being associated with the term “Impressionist”, which the press had coined and popularized, and insisted on including non-Impressionist artists such as Jean-Louis Forain and Jean-François Raffaëlli in the group’s exhibitions and The group was disbanded in 1886. Degas also began collecting works by artists he admired: such as El Greco, Manet, Pissarro, Cézanne, Gauguin, Van Gogh, Édouard Brandon, Ingres, Delacroix, and Daumier. In the late 1880s, Degas also developed a passion for photography. Photographing many of his friends, including Renoir and Mallarmé. He also photographed dancers and nudes, which he used for reference in some of his drawings and paintings. Much of Degas works depict dancers. These display his mastery in the depiction of movement, as do his racecourse subjects and female nudes. His portraits are notable for their psychological complexity and depiction of human isolation. Some of Degas’s work was controversial, but was generally admired for its draftsmanship. His La Petite Danseuse de Quatorze Ans, or Little Dancer of Fourteen Years, which he displayed at the sixth Impressionist exhibition in 1881, was probably his most controversial piece. The suite of pastels depicting nudes that Degas exhibited in the eighth Impressionist Exhibition in 1886 produced “the most concentrated body of critical writing on the artist during his lifetime however The overall reaction was positive and Degas soon joined forces with the Impressionists, and rejected the rigid rules, judgements, and elitism of the Salon In favour of the the experimentalism of the Impressionists. Degas held the view that a painter could have no personal life, Consequently Degas became isolated. Then The Dreyfus Affair controversy brought his anti-Semitic leanings to the fore and he broke with all his Jewish friends this together with his argumentative nature alienated him from most of his friends. Between 1907 and 1910 he Continued working in pastel and making Sculptures but he ceased working in 1912, when the impending demolition of his longtime residence on the rue Victor Massé forced him to move to quarters on Boulevard de Cliche. He spent the last years of his life, nearly blind, restlessly wandering the streets of Paris. During Degas’ life, public reception to his work ranged from admiration to contempt. As a promising artist in the conventional mode, Degas had a number of paintings accepted in the Salon between 1865 and 1870. These works received praise from Pierre Puvis de Chavannes and the critic, Jules-Antoine Castagnary And his dynamic paintings and sketches of everyday life and activities, and his bold color experiments, served to finally tie him to the Impressionist movement as one of its greatest artists and Degas is now considered “one of the founders of Impressionism”. Though his work crossed many stylistic boundaries, his involvement with the other major figures of Impressionism and their exhibitions. His paintings, pastels, drawings, and sculptures are on prominent display in many museums and he also greatly influenced several important painters, most notably Jean-Louis Forain, Mary Cassatt, and Walter Sickert and Henri de Toulouse-Lautrec. His Coronation Scot set a new British record of 114 mph, beating the previous record set by a Gresley A4, but this was eclipsed by another Gresley A4 “Mallard”, which set a new record of 126 mph for Steam Engines which still stands to this day During WWII he worked as a consultant for the Ministry of Supply and retired in 1944. He was knighted on 9 February 1943 and elected a Fellow of the Royal Society on his retirement, the only railway engineer other than George Stephenson to receive that honour. He was also president of the Institution of Mechanical Engineers for 1944. William Stanier, with the backing of Sir Josiah Stamp, Chairman of the Company, reversed the small engine policy, which the LMS had inherited from the Midland Railway, with beneficial results. William Stanier, sadly passed away 27 September 1965. Happily many of Stanier’s locomotives can still be seen working on Heritage lines throughout the United Kingdom. Including LMS 6201 Princess Elizabeth, the Stanier “Black Five” 45110 (which was used for the Fifteen Guineas Special in 1968) STANIER 8F 2-8-0 48773 and the Stanier Mogul No. 42968. The LMS/BR 45110, 48773 and 42968 steam locomotives can currently be seen at the Severn Valley Railway Engine House in Highley and Princess Coronation 8p Duchess of Sutherland LMS8233 recently visited the Severn Valley Railway from Butterley for the SVR Autumn Steam Gala. The British TSR-2 aircraft XR219 made its maiden flight from Boscombe Down in Wiltshire 27 September 1964. The British Aircraft Corporation TSR-2 was a cancelled Cold War strike andreconnaissance aircraft developed by the British Aircraft Corporation (BAC) for the Royal Air Force (RAF) in the late 1950s and early 1960s. The TSR-2 was designed to penetrate a well-defended forward battle area at low altitudes and very high speeds, and then attack high-value targets in the rear with nuclear or conventional weapons. Another intended combat role was to provide high-altitude, high-speed photo reconnaissance. Some of the most advanced aviation technology of the period was incorporated in order to make it the highest-performing aircraft in the world in its projected missions. Only one airframe flew and test flights and weight rise during design indicated that the aircraft would be unable to meet its original stringent design specifications which had been reduced as the results of flight testing became available. Prior to the TSR-2, Britain’s Royal Air Force had deployed the English Electric Canberra bomber, capable of flying at high altitudes and subsonic speeds. Like the de Havilland Mosquito before it, as originally conceived, the Canberra carried no defensive weapons and relied on its high performance to allow it to avoid defences. The introduction of the radar-guided surface-to-air missile (SAM) was a significant threat to this tactic. SAMs had speed and altitude performance much greater than any contemporary aircraft; the Canberra, and other high-altitude aircraft like the V bombers or United States’ B-52 Stratofortress, were extremely vulnerable to these weapons. The first aircraft to fall victim to the Soviet S-75 Dvina (NATO name “SA-2 Guideline”) SAM was a Taiwanese RB-57, a reconnaissance version of the Canberra, shot down in 1959. The solution was to fly lower; since radar operates in line-of-sight, detection of an aircraft flying at low altitudes is significantly hindered, thereby reducing time for enemy counter measures. In practice, trees, hills, valleys and any other obstructions reduce this range even more, making a ground-based interception extremely difficult. The Canberra was designed for medium- to high-altitude flight and was not suitable for continuous terrain-hugging flight; this would require a completely different aircraft.Low-level strike aircraft, or “interdictors”, grew into a new class of their own during the late 1950s. They generally featured high wing loading to reduce the effects of turbulence and cross-wind, some form of high-performance navigational radar to allow very low flight at high speeds, and large fuel loads to offset the higher fuel use at low altitudes. So the Ministry of Supply started work with English Electric in 1955, to create A new light bomber to replace the Canberra. These early studies eventually settled on an aircraft with a 2,000 nmi (3,700 km) ferry range, Mach 1.5 speed “at altitude” and 600 nmi (1,100 km) low-level range. A crew of two was required, one being the operator of the advanced navigational and attack equipment. The bombload was to be four 1,000 lb (450 kg) bombs. Sadly The TSR-2 was the victim of ever rising costs and inter-service squabbling over Britain’s future defence needs, which led to the controversial decision to scrap the programme in 1965. With the election of a new government, the TSR-2 was cancelled due to rising costs, in favour of purchasing an adapted version of the General Dynamics F-111, a decision that itself was later rescinded as costs and development times again skyrocketed. A replacement for the TSR 2 was eventually found in the Blackburn Buccaneer and McDonnell Douglas F-4 Phantom II, both types being previously considered and rejected early in the TSR-2 procurement process. Eventually, the smaller Swing-wing Panavia Tornado was also developed and was adopted by a European consortium to fulfill broadly similar requirements to the TSR-2. 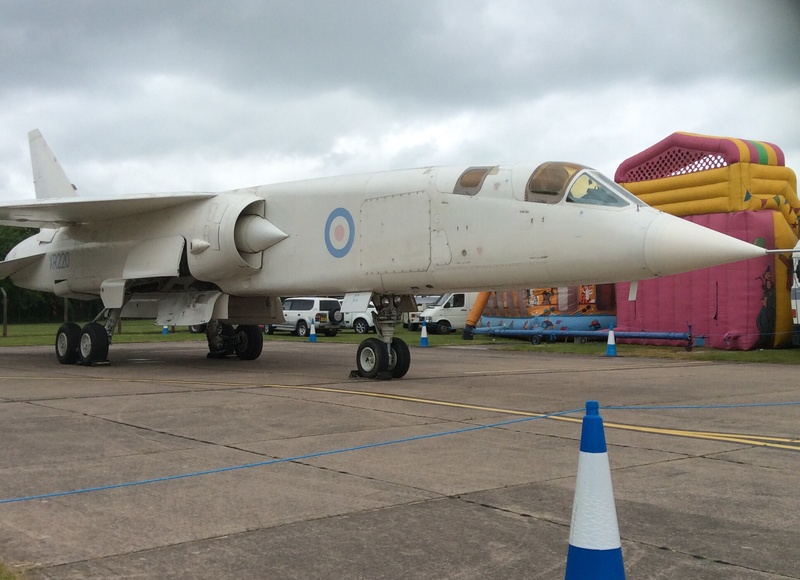 However the TSR-2 XR-220 is still on display at RAF Cosford. On 28 September 1956 USAF Captain Milburn G. Apt becomes the first man to exceed Mach 3 while flying the Bell X-2. The Bell X-2 was a research aircraft built to investigate flight characteristics in the Mach 2–3 range. The X-2 was a rocket-powered, swept-wing research aircraft developed jointly in 1945 by Bell Aircraft Corporation, the U.S. Air Force and the National Advisory Committee for Aeronautics (NACA) to explore aerodynamic problems of supersonic flight and to expand the speed and altitude regimes obtained with the earlier X-1 series of research aircraft.The Bell X-2 was developed to provide a vehicle for researching flight characteristics in excess of the limits of the Bell X-1 and D-558 II, while investigating aerodynamic heating problems in what was then called the “thermal thicket”.The Bell X-2 had a prolonged development period due to the advances needed in aerodynamic design, control systems, high-temperature resistant materials to be used, and other technologies that had to be developed. Not only did the X-2 push the envelope of manned flight to speeds, altitudes and temperatures beyond any other aircraft at the time, it pioneered throttleable rocket motors in U.S. aircraft (previously demonstrated on the Me 163B during World War II) and digital flight simulation. The XLR25 rocket engine, built by Curtiss-Wright, was based on the smoothly variable-thrust JATO engine built by Robert Goddard in 1942 for the Navy. Providing adequate stability and control for aircraft flying at high supersonic speeds was only one of the major difficulties facing flight researchers as they approached Mach 3. For, at speeds in that region, they knew they would also begin to encounter a “thermal barrier”, severe heating effects caused by aerodynamic friction. Constructed of stainless steel and a copper-nickel alloy, K-Monel, and powered by a liquid propellant (alcohol and oxygen) two-chamber XLR25 2,500 to 15,000 lbf (11 to 67 kN) sea level thrust, continuouslythrottleable rocket engine, the swept-wing Bell X-2 was designed to probe the supersonic region. A pair of less experienced but excellent pilots, Captains Iven C. Kincheloe and Milburn G. “Mel” Apt, were assigned the job of further expanding the envelope and, on 7 September 1956, Kincheloe became the first pilot ever to climb above 100,000 ft (30,500 m) as he flew the X-2 to a peak altitude of 126,200 ft (38,466 m). Just 20 days later, on the morning of 27 September, Apt was launched from the B-50 for his first flight in a rocket airplane. He had been instructed to follow the “optimum maximum energy flight path” and to avoid any rapid control movements beyond Mach 2.7. With nozzle extenders and a longer than normal motor run, Apt flew an extraordinarily precise profile; he became the first man to exceed Mach 3, reaching Mach 3.2 (2,094 mph, 3,370 km/h) at 65,500 ft (19,960 m). The flight had been flawless to this point, but, for some reason, shortly after attaining top speed, Apt attempted a banking turn while the aircraft was still above Mach 3 (lagging instrumentation may have indicated he was flying at a slower speed or perhaps he feared he was straying too far from the safety of his landing site on Rogers Dry Lake). 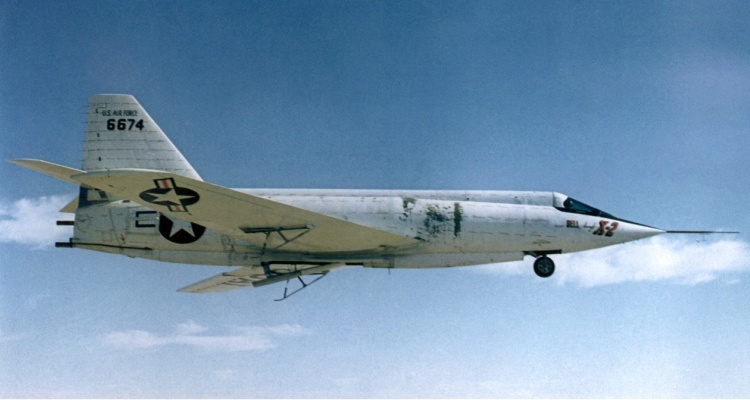 The X-2 tumbled violently out of control and he found himself struggling with the same problem of “inertia coupling” which had overtaken Chuck Yeager in the X-1A nearly three years before. although Chuck Yeager was exposed to much higher vehicle inertial forces, he found as a result of his extensive experience , that flying the X-1 was very familiar with its character, and he was able to recover. Apt attempted to recover from a spin, but could not, and fired the ejection capsule, which was itself only equipped with a relatively small drogue parachute. Apt was probably disabled by the severe release forces. As the capsule fell for several minutes to the desert floor, he did not emerge so that he could use his personal parachute. While the X-2 had delivered valuable research data on high-speed aerodynamic heat build-up and extreme high-altitude flight conditions, this tragic event terminated the program before the National Advisory Committee for Aeronautics could commence detailed flight research with the aircraft. The search for answers to many of the riddles of high-Mach flight had to be postponed until the arrival three years later of the most advanced of all the experimental rocket aircraft, the North American X-15. The world’s first public passenger railway, The Stockton and Darlington Railway (S&DR) was Opened September 27 1825, it was built between Witton Park and Stockton-on-Tees via Darlington, north-eastern England. It connected to several collieries near Shildon and at 26 miles (40 km) long, it was also the world’s longest railway line at the time. Planned to carry both goods and passengers, the line was initially built to connect inland coal mines to Stockton, where coal was to be loaded onto seagoing boats. Over the next 38 years the S&DR steadily expanded into a substantial network serving south and west Durham, Cleveland and Westmorland and running trains across Cumberland to within a few miles of the west coast. It was taken over by the North Eastern Railway in 1863, but by agreement continued to operate independently for a further 10 years. Much of the original 1825 route is now served by the Tees Valley Line, operated by Northern Rail. At the time steam locomotives were a new and unproven technology and were slow, expensive and unreliable. The initial impetus for steam power had come during the Napoleonic Wars, when horse fodder had become very expensive and had still not settled down, while improving transport and mining methods was making coal more plentiful. However, many people weren’t convinced that steam engines were a viable alternative to the horse. So at first, horse traction predominated on the S&DR, until steam could prove its worth. The first locomotive to run on the S&DR was Locomotion No 1, built at the Stephenson works though, in the absence of Robert, Timothy Hackworth had been brought in from Wylam. (On Robert’s return he took charge of maintenance at the S&DR’s Shildon’s Soho works. )Locomotion No 1 used coupling rods rather than gears between the wheels, the first to do so. The official opening of the line was on 27 September 1825. The first passenger train took two hours to complete the first 12 miles (19 km) of the journey and most of 600 passengers sat in open coal wagons while one experimental passenger coach, resembling a wooden shed on wheels and called “The Experiment”, carried various dignitaries. An experimental regular passenger service was soon established, initially a horse-drawn coach with horse provided by the driver. While passenger carrying was contracted out, locomotive coal trains were either paid by the ton, contractors providing their own fuel, which meant they tended to use the cargo, or by fixed wages, which meant they did not bother to economise.Three more engines were built similar to Locomotion then, in 1826, Stephenson introduced the “Experiment” with inclined cylinders, which meant that it could be mounted on springs. Originally four wheeled, it was modified for six. Not all engines came from Stephenson. In 1826 also, Wilson, Robert and Company, of Newcastle, produced one for the line which, rather than use coupling rods, had four cylinders, two to each pair of wheels. Possibly because of its unusual exhaust beat, it became known as Chittaprat. After suffering a collision it was not rebuilt. These early locomotives were slow and unreliable and Hackworth set out to produce an improved design and in 1827 introduced the Royal George, salvaging the boiler from the Wilson engine. He also invented a spring-loaded safety valve, because drivers had been tying them down to prevent them opening when the loco went over a bump. Steam traction was expensive in comparison to horse drawn traffic, but it soon proved that it was viable and economic. Steam locomotives could haul more wagons and haul them faster, so in a typical working day the expensive steam engine could haul more coal than the cheaper horse. It soon became apparent that mixing faster steam-hauled and slower horse-drawn traffic was slowing the operation down and so as steam technology became more reliable, horse-drawn traffic was gradually abandoned. At first, the organisation of the S&DR bore little relation to that of most modern railways and was run in the traditional manner of the wagonways of the time. The S&DR merely owned the tracks and did not operate trains; anyone who paid the S&DR money could freely operate steam trains or horse-drawn wagonloads on the line. This separation of track from trains resembled the canals, where canal companies were often forbidden from operating any boats. There was no timetable or other form of central organisation. Trains ran whenever they wanted and fights often broke out when rival operators came into conflict over right-of-way on the tracks. This chaotic situation was tolerable on completely horse-drawn traffic wagonways, but with faster steam trains it soon became unworkable, as the faster speeds meant a collision could have serious consequences. With the advent of steam, new operating methods had to be developed.The S&DR proved a huge financial success and paved the way for modern rail transport. The expertise that Stephenson and his apprentice Joseph Locke gained in railway construction and locomotive building on the S&DR enabled them to construct the Liverpool and Manchester Railway, the first purpose-built steam railway and the Stephensons’ Rocket locomotive. The company also proved a successful training ground for other engineers: in 1833 Daniel Adamson was apprenticed to Timothy Hackworth and later established his own successful boiler-making business in Manchester. The S&DR was absorbed into the North Eastern Railway in 1863, which merged into the London and North Eastern Railway in 1923.Much but not all of the original S&DR line is still operating today, together with the later lines to Saltburn and Bishop Auckland, but the rest of the substantial network the S&DR built up has been closed and dismantled.